At Christmas time I move through stores on autopilot always hoping something will jump out and say, “Buy me!” I want the object to make me feel like I have to purchase it. For a long time there were a lot of products telling me to buy them for Quinn. Going into my downstairs bathroom I am reminded of one of these earlier purchases. There in the corner of the soap rack, a rubber, pink bath-robed Hello Kitty toy hangs on. It’s covered in years of soap film and I periodically wash her down and prop her back up into position. When we had the bathroom renovated about eight years ago she was the first thing we bought for the new bathroom. She originally fit snugly over the top of some pink shampoo. The plumber polishing the grout off the tiles asked me about her. “I bet she has,” I added, knowing his daughter and mine were only a year apart. The truth is once you start looking for Hello Kitty items you can’t stop finding them. Which was good because Quinn loved Hello Kitty. She had acquired several t-shirts emblazoned with the squat little cat, lunch boxes, lamps, jewelry, socks, backpacks, pencil cases, tissue boxes, hair clips, and dozens of toys. When Quinn was less than three we happened upon a Sanrio exhibition at the Museum of Science and Industry in Chicago. 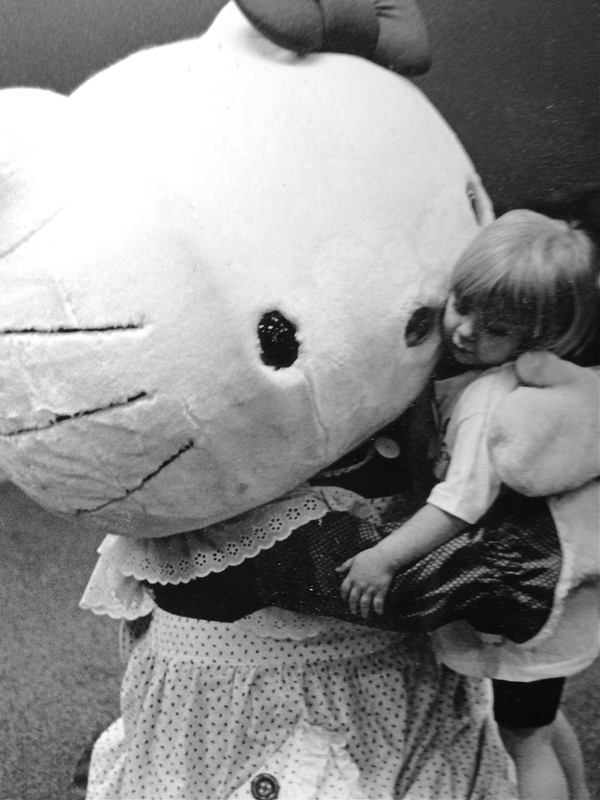 Quinn came face to face with a live Hello Kitty and fearlessly plunged into her arms. This cemented the beginning of a long and loving relationship. 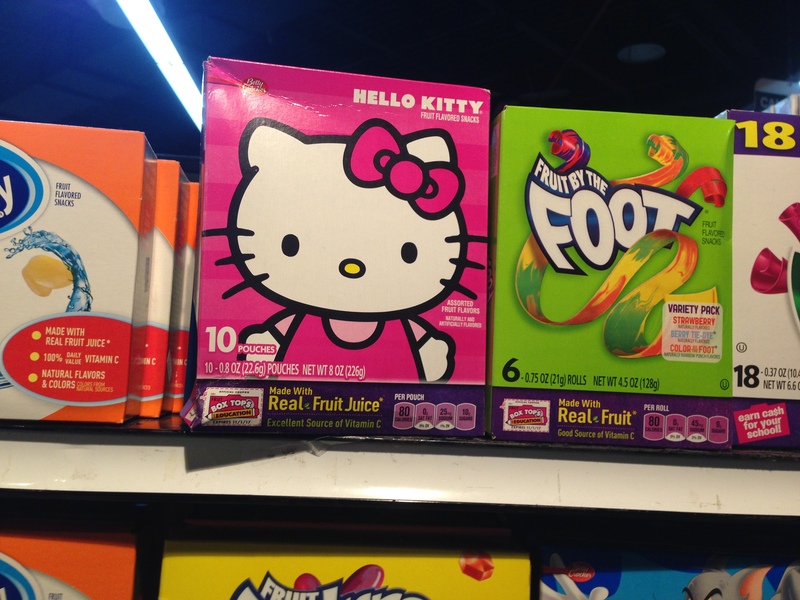 Initially Hello Kitty products were harder to find. We used to travel to Chinatown and visit the Sanrio store on Mott Street. One of us would distract a young Quinn while the other purchased a special item for Christmas like a Hello Kitty suitcase. When we found anything to do with Hello Kitty we bought it because we believed it was special. 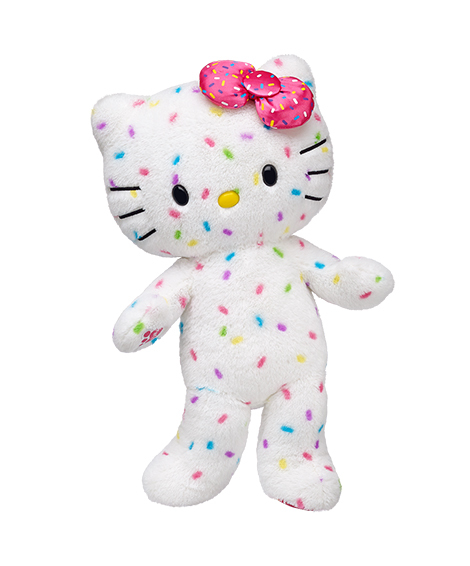 Just as Quinn’s fondness mushroomed, Hello Kitty’s popularity soared nationwide and she was available for the taking. Oddly, Quinn was largely alone in her fascination for the white cat among her immediate friends. Which might explain why the plumber with a young daughter had never heard of the character. When Quinn had a birthday party you could be sure that the majority of the gifts from her friends had something to do with Hello Kitty. To know Quinn was to know her love of this character. 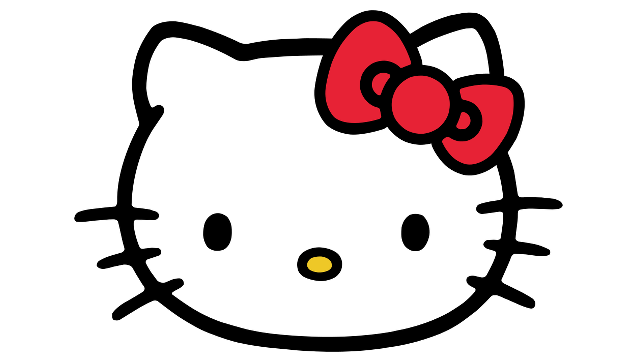 According to Sanrio, Hello Kitty yields over six hundred million dollars in revenue from over 80,000 different Hello Kitty branded products in more than 60 countries. That’s a lot of Hello Kitty. 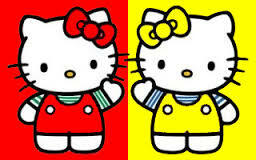 Maybe if we had known this, we might have stopped buying Hello Kitty products and accepted that our quest was futile. Sometime around 2003 when Quinn was ten she really owned enough but nobody took much notice, including her. The products continued to pour into her small bedroom. When she was in the eighth grade Rob took Jackson to Miami to sing in an honors choir. Rob had a lot of hours to fill while Jackson was rehearsing, and besides photographing he shopped and returned home with a large plastic Hello Kitty alarm clock. 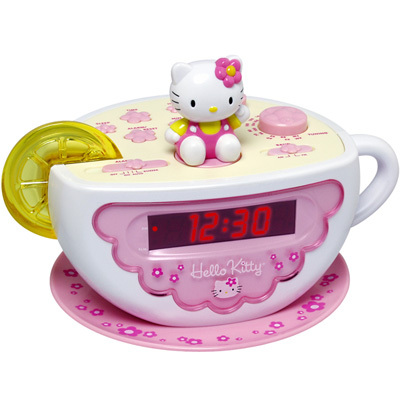 As he was setting up the clock, Rob said, “I knew when I saw it, Quinn had to have it.” Hello Kitty was coming out of an enormous teacup and a slice of lemon lit up when the alarm went off. It took up most of the available space on her on her nightstand. She was thirteen and still liked toys, but I think I detected a bit of the flame for Hello Kitty starting to dim with the arrival of the clock. On the following birthday her best friend gave her a large Hello Kitty lamp which we immediately set up, but she made no future mention of it. It went on this way for a while. Each time someone in our circle saw a new Hello Kitty product they thought of Quinn and bought it for her. The next year we bought her a fancy Hello Kitty watch. I think she wore it half a dozen times. I languished in a drawer before I took it over and started wearing to work. Some of my middle school students fawned over it and wished they owned one. I soon stopped wearing it as well. The following Christmas we went to a Kay Jewelry store to buy a Hello Kitty pendant necklace. It was cute and small and we believed represented a more grown-up version of the character. We discovered the cost was over a hundred and fifty dollars and left without buying it. I decided to feel Quinn out. “Oh look at this pretty necklace,” I said, pointing out the object in a sales flyer. “Please don’t buy that for me,” she said. On her next birthday her cousin dropped off a large stuffed Build-A-Bear Hello Kitty that talked. “Is she kidding?” Quinn complained rolling her eyes. She never took it out of the box. I had to admit it was an odd gift for a sixteen-year-old but in all fairness Quinn had never announced the infatuation was over. It had been over for a few years but maybe she didn’t have the heart to tell anyone. She had long stopped asking for these items, but people assumed once in love always in love. And they were so damn easy to find now. When she cleaned out her room all of the Hello Kitty items were piled into a box and sold at a tag sale or given away. The small items were brought into my classroom and placed inside my prize box. “You have an awful lot of Hello Kitty things in here,” a sixth grade girl remarked as she picked over her choices. Lots of people have childhood attachments to characters and retain a few of those things into adulthood. Rob’s niece loved the character Snoopy as a little girl and still appreciates receiving birthday cards with his image on them. Not Quinn. The shampoo cap is the only thing that remains because I can’t bring myself to toss it. I still have to stop Rob from buying anything Hello Kitty. He see’s one and say’s “Oh look,” and then stops himself. We remind ourselves that Hello Kitty is no longer part of our lives and we move on. They still talk to us but we’re trying really hard not to listen. 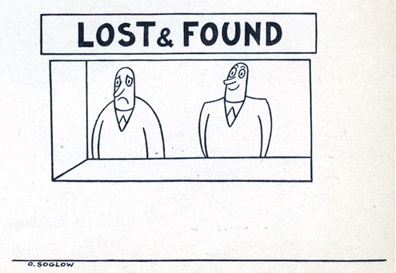 I lose things. I lose them and then I tend to blame other people. I never blame them to their face I just do it in my mind. I admit it’s a very bad habit especially since the suspected person hasn’t done anything. Most of the time the person never exists. 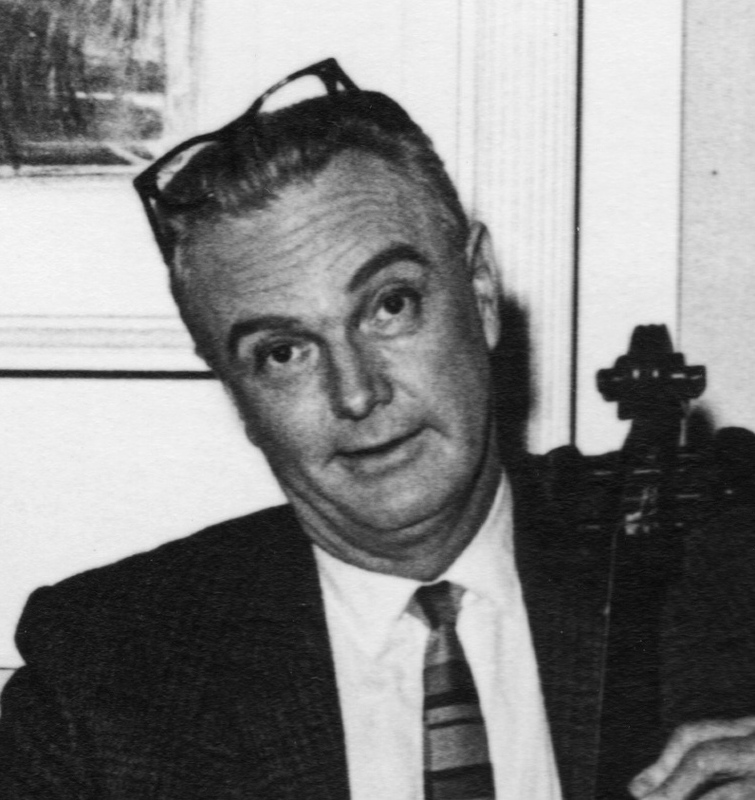 When I was young my father lost a lot of things too. Except in his case he knew he was the culprit. I remember watching him storm around the house searching madly for something. “I’m losing my mind!” he would bellow. “What’s the matter?” I would ask cautiously. I would stare at him and twist my mouth. “What?” he would have asked. “Yes,” I would have nodded. The entire family discovered his glasses on his head or resting on the car dashboard or next to the toilet with a magazine. My father “lost” keys, shoes, watches, socks, important papers, you name it, but he always just blamed himself. I have evolved. With my inherited bad habit there’s often an unsuspecting culprit. Several years ago we hired a carpenter from The Pennysaver (again) who showed up while we were both working and was let inside by our son who was home for the weekend. The carpenter was supposed to install a large glass medicine cabinet and repair a wall inside our clothe’s closet. After removing the old cabinet he discovered such a mish mash of beams inside the wall that he backed off of the job. Jackson called me and explained the problem but I was having none of it. “Let me speak to him!” I demanded. “Fine,” I said and we never spoke again. When I returned home he had done a nice job but I was still a little rattled by his manner. We begrudgingly mailed him a check for the full amount. That would have been the end of it except the following day I went to put fruit in the hand-blown fruit bowl that normally sat in the middle of the dining room table. We tried to remember the last time we had used it and who could have had the means to steal the bowl. The logical conclusion was the angry carpenter. “He was also unsure what we were going to pay him for the job and he wanted to get something.” I added. 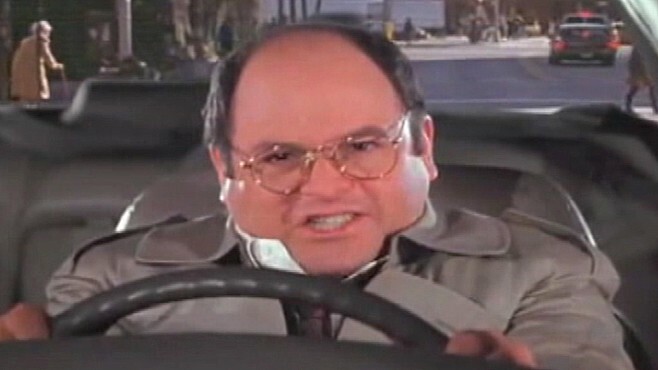 We had a fleeting thought to try to find out where he lived, drive over, and pull a George Costanza. “Ah hah!” we would exclaim, as we stormed into his kitchen and pointed at the fancy fruit bowl that his wife was busily arranging with her plastic fruit collection. But of course some sanity returned to us and we resisted. Over the years we would tell the fruit bowl story to anyone who would listen. Then this winter while I was housebound after foot surgery I started to lose things with reckless abandon. I lost my gold watch the same day we had a cleaning woman for the first time. Coincidence? She is a nice, hard working woman who rescued me after a fall and drove me to my doctor’s office, free of charge. Still we couldn’t find the watch and I had never left the house during the period it went missing. After the emergency trip to the doctor’s office I had returned home without my clown shoe and called the office to explain their error. They denied it but said I could come in for another shoe just the same. How inconvenient. Early spring arrived and I was able to return to work, remove the boot and eventually start to live a more normal existence. This led to cleaning out my closet where I discovered a long missing Chinese coin that Rob had given me for good luck. I pocketed the coin and carried on. 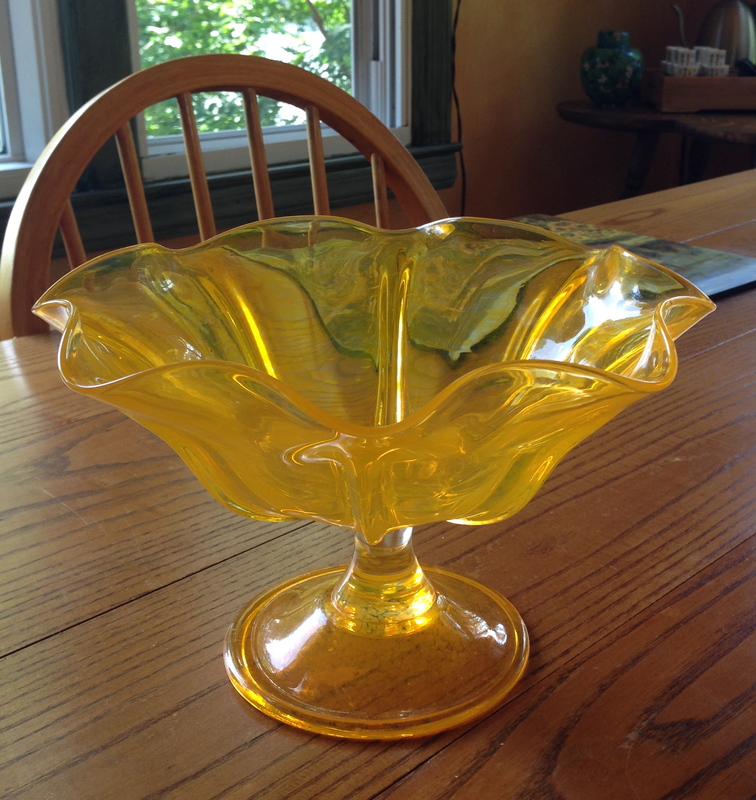 The next day I continued with my cleaning spree and way in the back of a deep cabinet over the refrigerator, under a platter, sat the hand-blown fruit bowl I had written off as stolen over four years ago. It was an odd moment that made us take stock of ourselves. It begged the question: Could we change? A few weeks later I opened up the sleeper couch in the den and discovered my watch—still ticking. As I strapped it to my wrist I cringed at the thoughts I had harbored against the innocent cleaning woman. Later that week Rob discovered the missing clown shoe inside a laundry basket in the basement. I tried not to think about the words I had spoken about an uncaring medical staff. These discoveries led to a top to bottom house cleaning that has not ended. Besides accepting personal blame for missing items I was going to combat my inherited forgetfulness with good old-fashioned organization. With everything back in order I was fully reformed. But in the course of two days I have rapidly regressed. My sister Susan was visiting. Just before an outing I was unable to track down my handbag even after an extensive search. I assumed the worst. “Maybe you should keep the door closed when you’re in the back,” Susan suggested completely unaware of our past transgressions. Rob called my phone and we discovered the bag and all the contents inside the den. The following day I decided that someone had made off with my laptop from the upper deck. It turned out Quinn had moved it to a chair in the dining room. Okay, so do I need a step program? Accusers Anonymous maybe? The night before my sister left we went down to the dock to sit for a bit and discovered an empty umbrella stand where a large, nine foot umbrella had once stood. “Are you sure,” Susan asked. “Well it was right there and now it’s not,” I said, pointing at the hollow stand. What else could one say? 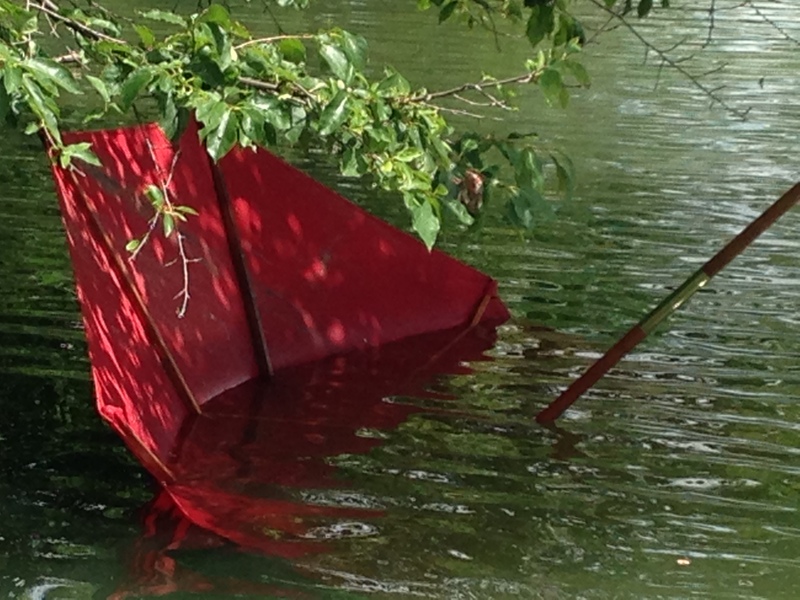 Several days later we discovered the umbrella had been retrieved from the muck and returned to our dock by an anonymous and helpful neighbor whose very last intention was to keep it for themselves. I think I’ll start that chapter of false accusers–if I can find any. 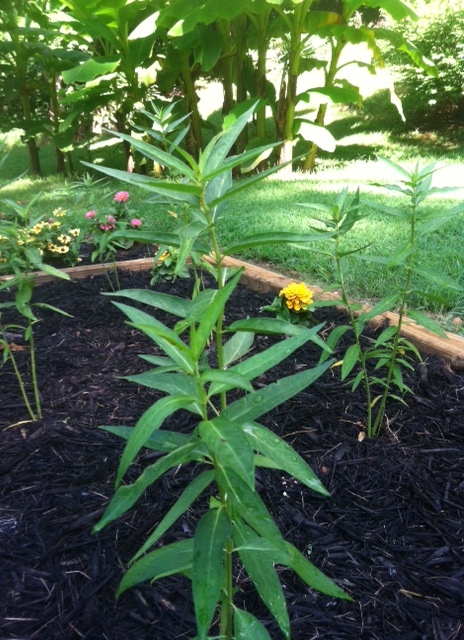 Recently, my sister Susan who lives in North Carolina, sent me a photograph of her newly planted Milkweed bed. It boasted six young Milkweed plants lined up in two neat rows. She and her husband Tim had sent away for the plants as part of a grassroots effort to help save the Monarch butterflies. “I became involved in this dilemma after reading the novel The Butterfly’s Daughter last year,” Susan said. “Will the Monarchs be able to find your plants?” I asked. We grew up in a family of six in Northern Illinois. We lived in a split-level home that sat alongside a small, undeveloped stretch of wild prairie. Wildflowers grew in abundance. Each summer produced Bachelor Buttons, Black-Eyed Susans, Thistles, Goldenrod, Queen Anne’s Lace and Milkweed. Monarchs were commonplace. I remember in the early fall we would look out on our yard and see hundreds of Monarchs clinging to the Forsythia bushes. They might stay for a few hours or a day or two before flying away, followed by a few stragglers that came along every few days after the first sighting. I have always known they migrated but never thought much about them or considered where they were heading. When we first moved to the lake, thirteen years ago this month, I was out walking with my children and we came across some Queen Anne’s Lace. “Queen Anne was sewing some lace and she pricked her finger with the needle, causing a single drop of blood to fall onto the lace,” I explained, pointing to the single crimson flower at the center of the white lacy plant. “How did she bleed on all of them?” my then six-year-old daughter had asked. “It’s just folklore,” I said as I spied some Milkweed. I hadn’t seen any since I moved from the Midwest. “It feels like silk,” my son said. He pulled the fine threads apart and we watched them float into the wind. My book club is currently reading Flight Behavior by Barbara Kingsolver. The book is high on scientific information about Monarchs and climate change, which is fed to the reader through human drama. Kingsolver draws heavy parallels between the plight of the Monarch and human choices. It’s unpleasant to read about the world falling apart. Losing the Monarchs is a symptom of those choices. I actually hadn’t thought about Milkweed since that first time we stumbled upon it, so I set out on my morning walk in search of it. Today, I didn’t find any. I also only found three Queen Anne’s Lace plants. Three? And the three I did find didn’t even hold the red drop of queen’s blood. I felt so obtuse that I hadn’t noticed less wildflowers growing around the lake until I read Kingsolver. I called my sister back. “If you used to have Milkweed then Monarchs were there,” she said. “Plant some and they’ll come back.” She told me where to order the plants. 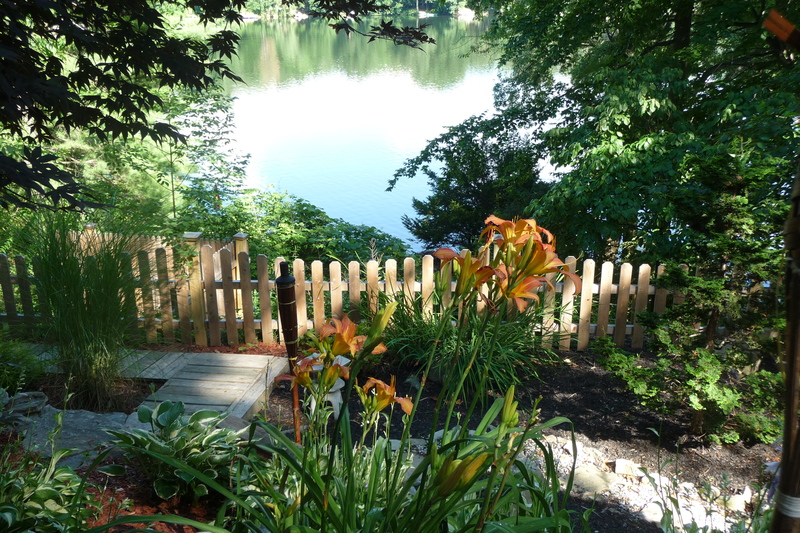 When I look out at my lake from the deck, my world seems visually beautiful. It’s hard to believe from my vista that nature is out of balance, but intellectually I know it is. 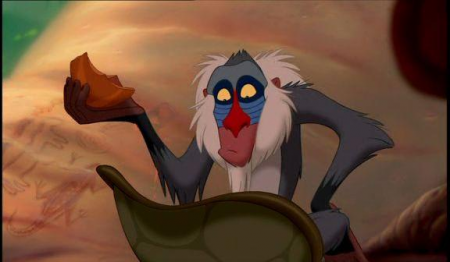 It reminds me of the words of the baboon Rafiki from The Lion King. The truth is I want to find the drop of queen’s blood inside the lace in abundance and I want bright orange Monarchs to pass through my yard and light on a Milkweed plant.